Paths for Communities 5 at Marston MoretaineWalking RouteA walk through the eastern part of the Vale with views of the Greensand Ridge and the Cardington Sheds with the opportunity to explore Kings Wood, Glebe Meadows, Conquest Wood and Shocott Spring before catching the train or bus back to the Forest Centre. 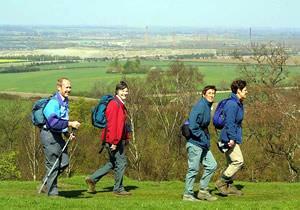 This linear walk starts at the Forest Centre at Marston Moretaine and ends at Bedford St Johns Rail Station. A walk through the eastern part of the Vale with views of the Greensand Ridge and the Cardington Sheds with the opportunity to explore Kings Wood, Glebe Meadows, Conquest Wood and Shocott Spring before catching the train or bus back to the Forest Centre.